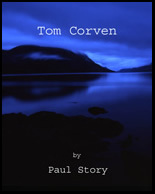 The novel Tom Corven is a nerve racking experiment by Paul Story. It is the first novel in the world to be written specifically for podcasting. I am committing myself to provide the community with a regular series of chapters, written to a professional standard and recorded by me to the best of my ability, free of charge, until the book is complete. I am doing this in the hope that, once hooked, you will want to read (or listen to) more. Writing to a deadline in fiction is extremely difficult because you are effectively saying to yourself (and everyone else) that there will be no excuses, no writer's block, no failure of the imagination and definitely no lazing around. I aim to post a chapter every few days (I'll try for Mondays and Thursdays). By the time it is finished, there will be approximately forty chapters. The work is not copy-protected (although I retain all copyrights). You may distribute the recording freely; I only ask that no one alters the sound-file or attempts to make money from it. You may be interested to know (or not) that I lived in a small mountain tent on the Island of Arran for four months last year and it is this experience that informs the landscape and atmosphere of Tom Corven. If you'd like to know more about the background to the project, it's here. Also click here for a Note from the Author.